Do You Need a Writing or Creativity Retreat? I’ve just returned from a solo trip to Sihanoukville, Cambodia, where I spent 12 days on the beach, hammering away on my new book, The Ghosts of Bùi Viện Street. This was the second time in the last few months I’ve left home to work on the book. Back in September, I had a wildly productive month of writing in the Vietnamese capital, Hanoi. Yes, there’s irony in the fact that to finish my book about Saigon, I keep leaving Saigon, but being away from home takes me away from my everyday distractions. 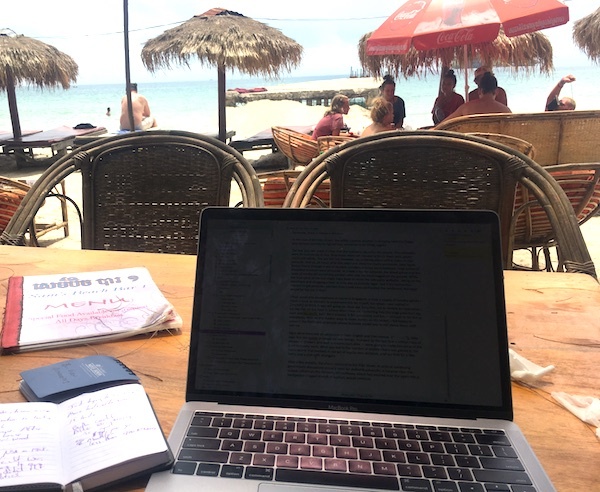 I set my own hours – eat when I want, sleep when I want, write when I want – and with a little self-discipline, the illusion of “being on vacation” makes me more productive. Guilt and rewards are also motivators. As I work from my sea-view bungalow, I tell myself that yes, this is an idyllic setting, and if I ever want to use this excuse to leave home again, I can’t screw around. I have to get done what I came here to do. If I want to go for a splash in the Gulf of Thailand, or watch the sunset with a happy hour cocktail, I must earn it. I set a daily writing quota – in words or hours. I get no rewards until I meet my quota. 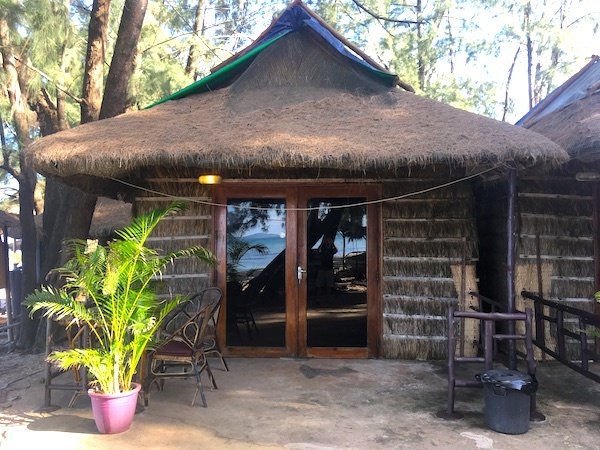 I’m fortunate to live in a city where I can fly to places like Sihanoukville for cheap, and rent a scruffy little bungalow on the beach for 20 bucks a night. I realize it’s not so easy for everyone to get away to places like this. But if you have a project you’ve been struggling to complete, a retreat might be just what you need – for a weekend, a week, whatever you can wrangle. You can do it on your own, or with a creativity partner. If you go with a partner, be sure it’s someone with a project of their own. A friend or significant other who is just there to relax and have fun will distract you from your goals. But traveling with someone else who is writing, drawing, painting, or even meditating for several hours a day – whatever they want to focus on – can be helpful in that you have someone to hold you accountable and make sure you’re doing what you are there to do. If you have family commitments, this might require some negotiation or creative planning. Let your spouse or significant other know this is important to you, and think about good times to go. In my case, my wife, Kattina, was heading to an education conference in Borneo, followed by a spring-break climb up Mount Kinabalu. As I’ve written before, slogging up mountains is more her thing than mine, so she found a climbing partner for the vacation part of her trip. When we flew back to Saigon, we each returned home with stories to tell. As a writing coach, I must be cautious about recommending a personal retreat like this. “I can only be productive when I leave home” is a beautiful excuse for never writing. When we can’t get away, there are lots of other ways we can shoehorn time into our schedules to get the writing done that we want to do. We need to work within the realm of whatever our possibilities are. But if the rest of your life keeps encroaching on your creative projects, perhaps a getaway will help. It doesn’t have to be long or far away. A simple change of scenery, and a deal with yourself to prioritize your project, can help you get it done. Need Help Getting Motivated or Finding Time? And if you’ve got projects you’re struggling with, if you need help figuring out what’s getting in your way and how to overcome it, I offer writing and creativity coaching via Skype, phone, and in person. Learn more here. Get Both for $18 – Use this link and you’ll get immediate access to course number one. Within 24 hours, I’ll send you a link to get into the second course in the series for free. Episode 5: Shannon Leone Fowler, Author of "Traveling With Ghosts"
Stay up to date on the latest travel tales, writing tips, and more! Sign up for the free Globejotting Newsletter. Dave Fox is a writing coach with more than two decades of experience, and a Transformation Academy certified life coach. If you’ve got big writing goals, dreams you want to achieve but you’re not sure how to get there, or if you’re struggling with something and you need help turning things around, Dave can help you create a path to more fulfilling and authentic life. Dave's online writing and travel courses get RAVE reviews! Follow the links below for special discounts! Travel Journaling: Capture your travel memories in words. Travel Writing & Publishing: Transform your journals into stories you can publish. Humor Writing: Professional humor tricks for writers, speakers, and other misfits. The Psychology of Writing 1: Overcome writer's block and write with confidence. The Psychology of Writing 2: Defeat distractions, stop procrastinating, and write! Deep Travel: Have adventures no guidebook can tell you about. Be sure to check out his low-priced "Kindle Single" e-books too! Follow Globejotting on Facebook, Twitter, and Instagram! You'll get all the latest news and your friends will think you're scintillating!